Celox 1908, was the first off the 'Celox Mould' and was designed by Arch Logan and built by Logan Brothers in 1908. Her sister mullet boat Mona also 26ft was built by Logan Brothers in 1909. Mona may now be in desperate condition. Celox, H8, is the only currently able 'Logan Brothers Built' mullet boat of 26ft length, still giving thrilling, wild, exciting, fast, and quality sailing, with timeless elegance and refined ability to quickly sniff and move on fickle airs. Fortunately her bouyancy has increased significantly with a flush deck, though sadly not original this gratefully makes Celox very comodious inside and enjoyable at anchor, and importantly will surely resist being driven under with all sails up in any sudden severe squalls. Celox's rig has increased in height and now has a bermuden cutter rig that can fly an 11.5 metre (38ft) Genoa. In a good wind and a crew weight of a dozen on the rail, could have Celox planing at wild speed. Celox is none the less delightfully handled by one. Celox is still very contemporary looking, the flush deck graces her, and the efficient rig and sails are being quietly tweeked to optimum, and painted. 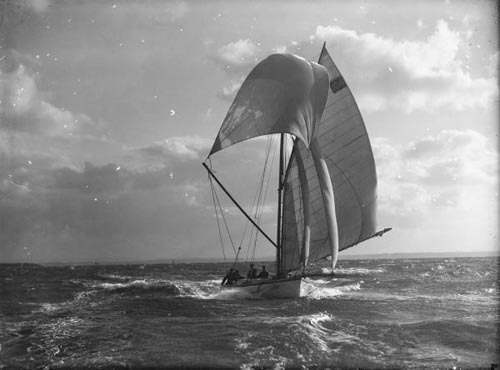 Arch Logan, who designed Celox, also designed Omatere, another 26ft mullet boat, which Arch Logan himself built in 1913, and which completes the Logan 26 foot fleet, of three. The 'Celox mould' was used for many other 26 foot Mullet boats built to the same measurements, by other famous boat builders of the day, they were all hotly in use as fishing boats and sailing yachts, often racing together year after year. Celox's bigger sister Cora, the only 28ft Logan Brothers mullet boat was built in 1910, and is in Bay of Islands. Celox: 'a fast cutter' is a splendid indigenous N.Z. Auckland yacht, able to speed a 1000kg of fresh mullet to market, and happily dances gracefully to the moon and Bay of Islands breeze. Superb testimony of Logan Brothers: design excellence, fine yacht building skill and as winning helmsmen. my dad co-owned the Celox late 1920s 1930s I believe.